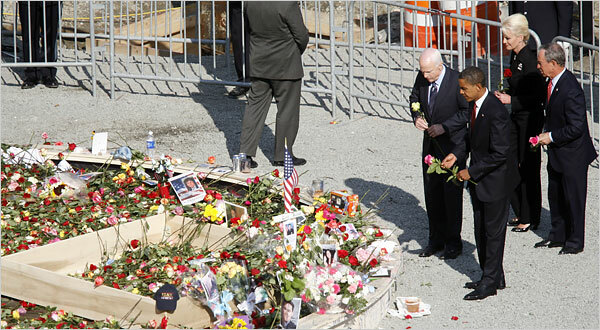 Senators Barack Obama and John McCain with Cindy McCain and Mayor Michael Bloomberg at the World Trade Center site on Thursday. DENVER — Barack Obama accepted the Democratic Party presidential nomination on Thursday, declaring that the “American promise has been threatened” by eight years under President Bush and that John McCain represented a continuation of policies that undermined the nation’s economy and imperiled its standing around the world. The speech by Senator Obama, in front of an audience of nearly 80,000 people on a warm night in a football stadium refashioned into a vast political stage for television viewers, left little doubt how he intended to press his campaign against Mr. McCain this fall. But Mr. Obama went beyond attacking Mr. McCain by linking him to Mr. Bush and his policies. In the course of a 42-minute speech that ended with a booming display of fireworks and a shower of confetti, he offered searing and far-reaching attacks on his presumptive Republican opponent, repeatedly portraying him as the face of the old way of politics and failed Republican policies. And he went so far as to attack the presumed strength of Mr. McCain’s campaign, national security. “You know, John McCain likes to say that he’ll follow bin Laden to the gates of hell, but he won’t even follow him to the cave where he lives,” he said. The speech loomed as arguably Mr. Obama’s most important of the campaign to date. It was an opportunity to present himself to Americans just now beginning to tune in on this campaign, to make the case against Mr. McCain and to offer what many Democrats say he has failed to offer to date: an idea of what he stands for, beyond a promise of change. To that end, he emphasized what he described as concrete steps he would take to address the anxieties of working-class Americans, promising tax cuts for the middle class and pledging to wean the country from dependence on Middle East oil within 10 years to address high fuel prices. With the speech, Mr. Obama closed out his party’s convention here and prepared for a quick shift of public attention to the Republicans as Mr. McCain moved to name his running mate and his party got ready for its convention in St. Paul on Monday. He delivered it in a most unconventional setting, becoming the third nominee of a major party in the nation’s history to leave the site of his convention to give his acceptance speech at a stadium. In this case, it was Invesco Field, set against the Rockies and about a mile from the arena where he had been nominated the night before. His aides chose the stadium to signal a break from typical politics and to permit thousands of his supporters from across the country to hear him speak. And it came on a night that offered — by the coincidence of scheduling — a reminder of the historic nature of the Obama candidacy: 45 years to the day after the Rev. Dr. Martin Luther King Jr. delivered his “I Have a Dream” speech on the Mall in Washington. Mr. Obama is the first African-American to be nominated for the White House by a major party, a fact that, for all its significance, has been barely mentioned over the course of this four-day gathering. Mr. McCain marked the occasion of the speech by releasing a television advertisement in which, looking into the camera, he paid tribute to Mr. Obama and his accomplishment. “How perfect that your nomination would come on this historic day,” Mr. McCain said. “Tomorrow, we’ll be back at it. But tonight, Senator, job well done. The advertisement stood in stark contrast to a summer of slashing attacks on Mr. Obama by Mr. McCain that apparently contributed to the tightening of this race. And the softer tone did not last; Mr. Obama was still on the stage, watching the fireworks, when Mr. McCain’s campaign issued a statement attacking him. “Tonight, Americans witnessed a misleading speech that was so fundamentally at odds with the meager record of Barack Obama,” said Tucker Bounds, a spokesman for Mr. McCain. In his speech, Mr. Obama scored Mr. McCain for raising questions about his patriotism, and trying, he said, to turn a big election into a fight on small squabbles. 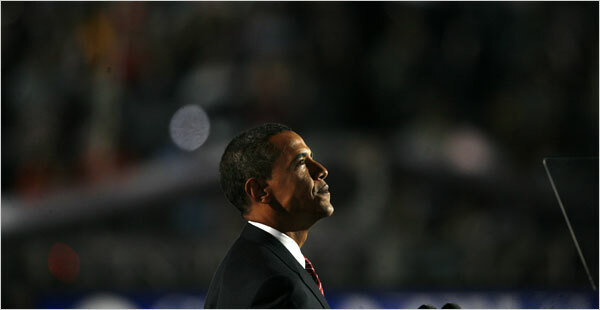 Mr. Obama looked completely at ease and unintimidated by his task or the huge crowd that surrounded him. And he chastised Mr. McCain for trying to portray him as a celebrity, an attack aides say has been particularly damaging, offering a list of people who he said had inspired him, from his grandmother to an unemployed factory worker he met on the campaign trail. Mr. Obama delivered his speech on a day of considerable political churn. Even as Mr. McCain was paying tribute to Mr. Obama on television, his aides disclosed that he made a choice for vice president and would announce it on Friday, timing intended to draw attention away from Mr. Obama on a day in which he and his running mate, Senator Joseph R. Biden Jr., would be starting a joint campaign swing. But the table for Mr. Obama was also set by speeches from some of the best-known Democratic leaders. They were led by Al Gore, the former vice president who confronted a question that has, fairly or not, hovered over Mr. Obama as he struggles in his contest with Mr. McCain. Mr. Obama used much of his speech to link Mr. McCain and Mr. Bush — a line of attack that his aides view as their strongest going into the fall — and signaled that he saw next week’s Republican convention, when Mr. McCain and Mr. Bush are to appear together, albeit briefly, as a way to press that line of attack. Speaking in generally broad terms, Mr. Obama offered a contrast between Republican and Democratic views of the role of government. The outdoor acceptance speech was by any measure a risky gambit by a campaign that has shown a taste for taking chances and breaking with convention, as his aides acknowledged. Bad weather could have soaked the moment. Mr. Obama’s first question to aides when they proposed this was, “Will it rain?” It did not; the day was dry, if hot. When John F. Kennedy held his outdoor rally at the Los Angeles Memorial Coliseum in June 1960, half the seats were empty, as a dispatch in The New York Times noted in dismissively describing the event as a “fresh air vaudeville.” The stadium here was packed by 5:15 mountain time, three hours before Mr. Obama was to take the stage, after a week in which Democrats and Obama supporters had been hustling for tickets. Barack Obama is officially the Democratic Party’s candidate for the US presidency. On the third day of the Democratic convention in Denver his defeated rival, Hillary Clinton, submitted a motion to elect Obama the winner by acclamation, and in his speech her husband Bill Clinton expressed his unconditional support for Obama. Later in the day, Joe Biden was officially elected as Barack Obama’s running mate for the vice-presidency. A roll call like this, coming forward state by state to vote for the presidential candidate, is largely just a tradition. The result is known in advance. This time too Barack Obama had for months been the unofficial Democratic candidate. But the long and bitter battle with Hillary Clinton for that nomination had left wounds. That’s why the tradition had to take a dramatic turn. Orchestrated drama, of course, since it had been negotiated in advance and arranged precisely so it could be shown live in the half-hour around mealtime when the big three TV networks have their evening news. With a rapid blow of her gavel, convention chairwoman Nancy Pelosi ensured that whatever opposition remained would not be heard. The convention now belonged to Barack Obama. Most of Hillary’s supporters resigned themselves to the situation. “My fellow democrats, I say to you, Barack Obama is ready to lead America and to restore American leadership in the world.”Clinton referred to his own presidential campaign in 1992, when the Republicans tried to write him off as an inexperienced lightweight, just as they are doing with Obama today. Clinton didn’t do too badly, as he modestly pointed out. So that should work again in 2008. The speech was the perfect launching pad for vice-presidential candidate Joe Biden and for Barack Obama’s acceptance speech which will round off the convention on Thursday evening.